Gold has a long history as a premier dental restoration. Its use dates back to the ancient Egyptians, and it has retained its usefulness through the centuries. 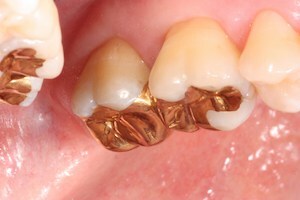 In modern society, gold restorations have somewhat fallen out of favor with patients due to esthetic concerns. This is unfortunate, as many people are unaware of the considerable benefits that gold dental restorations have to offer. Additionally, depending on the location and nature of the restoration, it may not be visible when you smile. Dr. Spath is a talented cosmetic dentist, and he can create a stunning and strong smile, using gold crowns or fillings on the back teeth, where strength is most important, and tooth colored porcelain or resin on the visible teeth. Gold has unique and amazing properties of resilience, malleability, and biocompatibility. 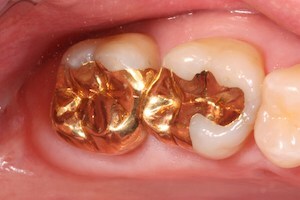 There are several techniques for placing gold dental restorations, with the most common being cast gold, which is approximately 18 karats. It is the strongest restorative dental material available. 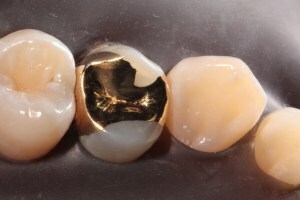 The next common technique, known as gold foil, is a tried-and-true method that has been used in dentistry for generations. With this technique, the restoration is made of 24-karat gold. In keeping with his dedication to providing the highest quality of dentistry, Dr. Spath advocates the use of gold restorations. As a dental material, gold has many unique benefits in addition to biocompatibility and strength. One of the most important is malleability. It can be shaped with precision, to fit the healthy portion of the tooth structure. Unlike many common dental materials, gold retains its strength even when it is very thin. This allows your dentist to restore a tooth without removing healthy tissue or reshaping the structure. Gold restorations have exceptional durability when placed by a qualified practitioner, but it requires specific training and experience to achieve optimal results. Dr. Spath has studied the technology and optimal technique of gold restorations extensively. He has worked closely with the highly respected R.V. Tucker Cast Gold Study Club of Orange County as a member and Secretary. 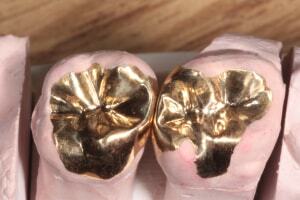 He also has many years of experience successfully placing gold restorations.